Intertops Poker and Juicy Stakes are offering online poker players the chance to take part in the main event at the upcoming St Maarten stop of the TK Poker Tour for as little as $1.10. The Horizon Poker Network sites have launched a three-tier online poker satellite tournament series that is promising to award the winner with a prize package into the $1,150 buy-in main event of the upcoming Caribbean extravaganza, which is scheduled to take place from March 16 to 24 at the Sonesta Maho Beach Resort And Casino complete with a guaranteed $75,000 prize pool. The pair revealed that the ultimate winner of their online poker tournament series, which has already kicked off, will receive a prize package worth $3,500 and additionally encompass accommodation and food as well as $500 for travel expenses. “It’s great to be able to hit the beach in the afternoon before a night of poker,” read a statement from Tim O’Keefe, who won a main event seat at last year’s TK Poker Tour St Maarten via Intertops Poker. 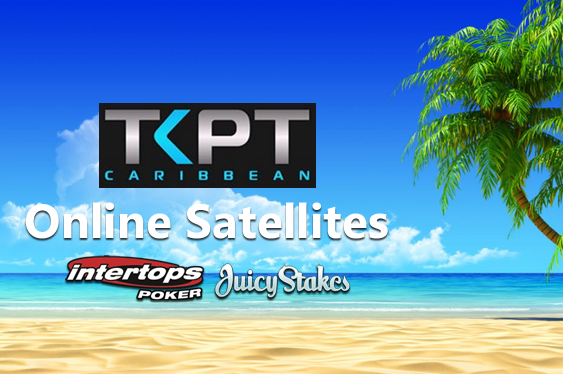 Three-tier online poker satellite tournament series from Juicy Stakes and Intertops Poker is promising to award a prize package into upcoming St Maarten main event worth $3,500.